At Christmas, my daughter, Dragonfly (age 7) got the movie Hidden Figures as a present. The video tells the story of three female mathematicians, who stood against racism, sexism, and helped the USA win the space race. The movie is a great introduction to the history of NASA, racial segregation, and women in science, while still managing to only be rated PG. It's a great video for moms and daughters to watch together (although my husband enjoyed it as well). If you haven't yet seen the movie, I highly recommend it. 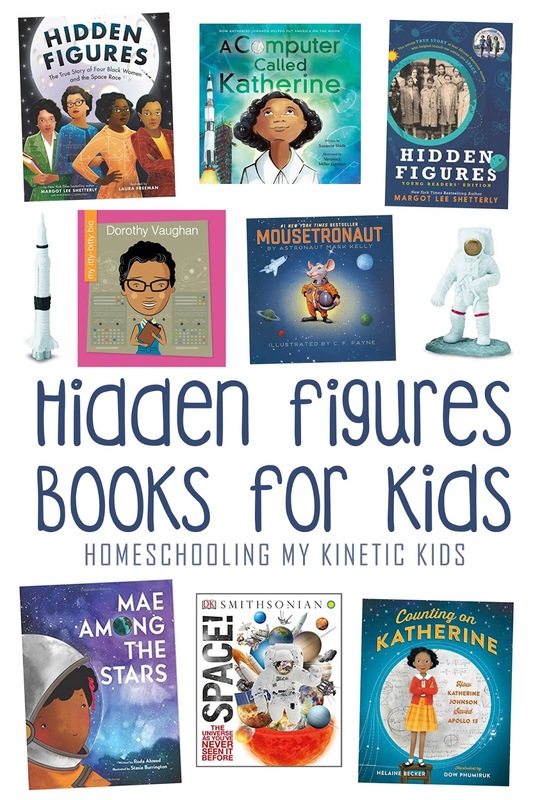 One of the inspirational women was Katherine Johnson, worked long mathematical equations by hand in the years before computers were in wide use. Even after the first "calculating machines" were available at NASA, Katherine still double-checked the computers work! I love how Hidden Figures shows women working complicated math problems, as it encouraged my own daughter in her math learning. As a mom, I'm always looking for women to inspire my daughter, and I'm pleased to have found Katherine. Many people are talking about S.T.E.M. (science, technology, engineering, math) right now and encouraging kids to explore concepts related to those subjects. Unfortunately, girls are still lagging behind boys in the S.T.E.M. fields. Whenever women can point girls to roll models in the S.T.E.M. fields, I think it should be done. In researching the women of Hidden Figures, I began to explore books about their lives and space technology in general. These are just a small amount of all the books I found. The following graphic shows my favorites and the book titles below link to the book or product. My kids love to play with the Safari Ltd toob figurines. For a theme unit on Katherine Johnson, rockets, and NASA, the Safari Ltd Space Toob is perfect. They're great for sensory bins, small world play, and dioramas. 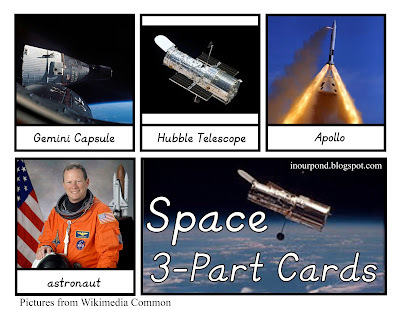 Combine them with my Montessori-inspired 3-part cards to expand the learning possibilities even more. The printable can be used to match the figurines to real pictures of the objects, practice reading, spell new words, expand vocabulary, and inspire stories. 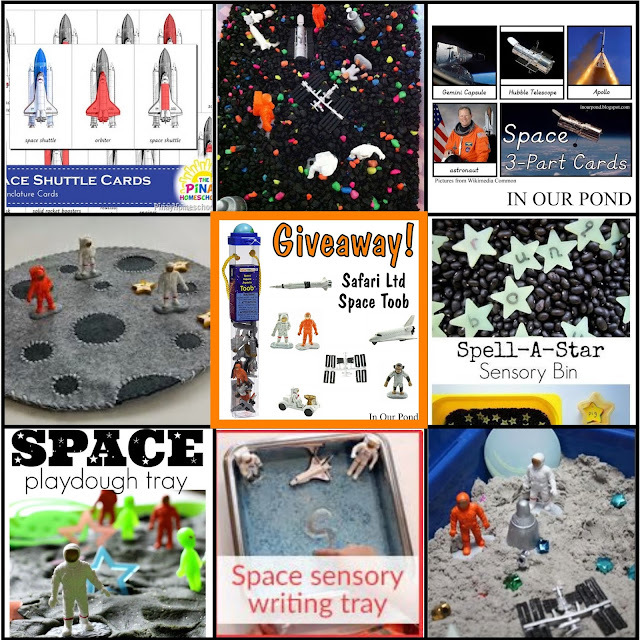 Scroll to the bottom of the post for a chance to win a Space Toob from Safari Ltd or click here to order your own from Amazon. 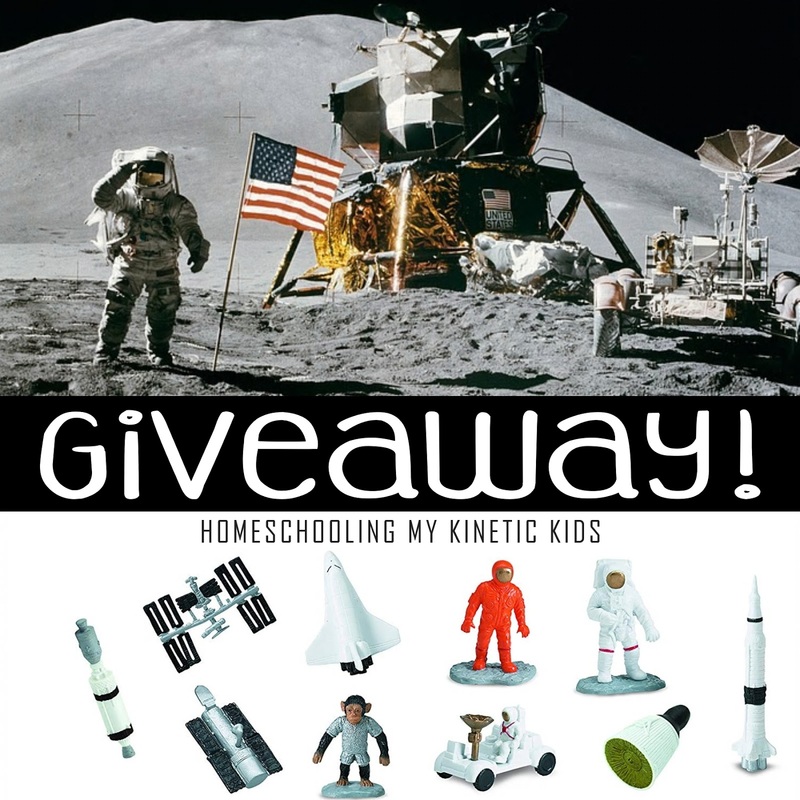 About two months ago, one of my blogger friends began organizing a S.T.E.M and Literature blog hop called "Storybook Science." As soon as I heard about the series, I knew which book I wanted to highlight- "A Computer Called Katherine!" At the time, it hadn't even been published yet, so I had to preorder it on Amazon and wait for it to arrive. It was a bit of a gamble, but we were so pleased with the book when we finally got to read it! 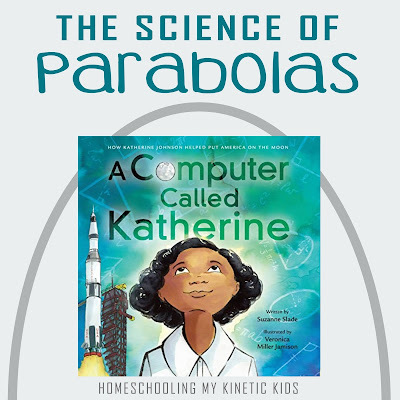 "A Computer Called Katherine" tells how a girl, who used to count everything, went to work for NASA and won the space race. The book touches briefly on the topics of racism and sexism, but mainly focuses on Katherine's love of math. When the negative subjects are addressed as part of her story, the author uses a cute phrase, "Katherine knew that was wrong- as wrong as ___ (basic math problem with the wrong answer)." Kids will enjoy "correcting" the book and giving the right answer (mine did). 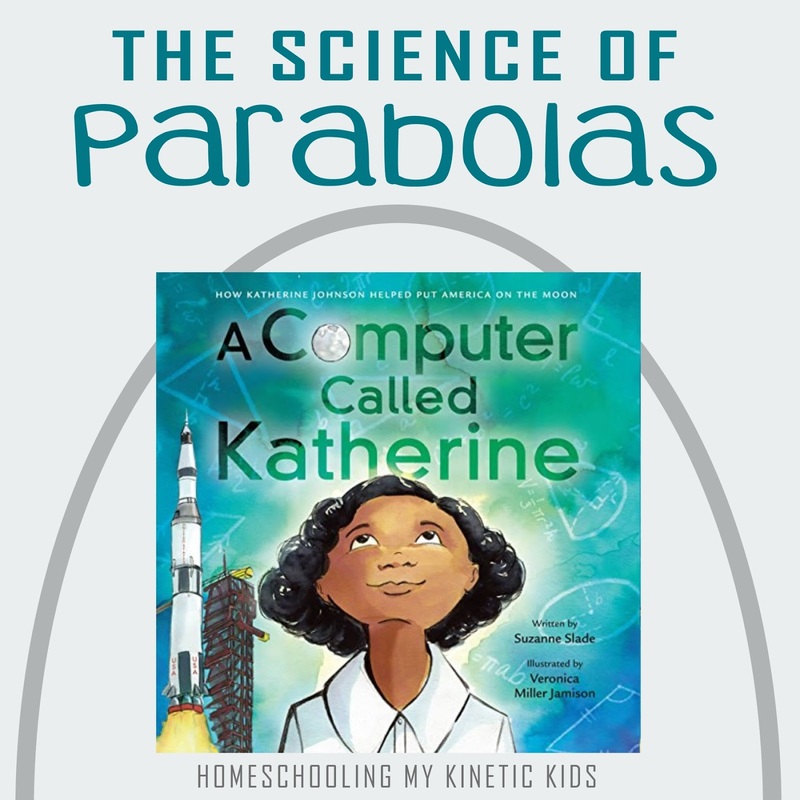 "A Computer Called Katherine" also talks a lot about parabolas. For my kids (ages 7, 6, and 5), this was a new concept. We talked about the shape that a parabola makes on a graph and in real life, looked around the house for examples of the parabola shape, and made them with our hands. We also discussed the relationship to the earth and the moon and sang about the "earth going around the sun" and "the moon going around the earth." The book launched an in-depth look at gravity, how it effects the earth and moon, and how difficult it would be to aim a rocket at the moon. 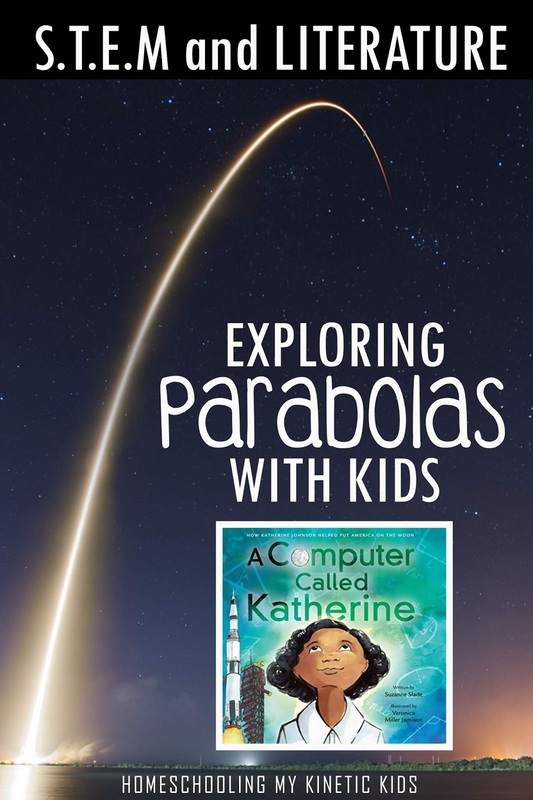 I had intended that we would do a catapult experiment to explore the shape of the parabola in a fun way, but it didn't happen before this publishing date. My original thought was that we'd work on trying to get our marshmallow to land in a cup. We would then discuss how difficult the task was and talk about how Katherine and the NASA engineers had to work hard to make sure their rocket landed exactly where they hoped it would land. They didn't get a second chance. Instead of posting about my own experiment, I decided to do a tiny round-up of ways to explore parabolas with kids. Under the graphic, I listed the source of each activity and explained how I would use it to lead kids in a discussion of parabolas. In most of the links (colored text), kids don't have to have any prior knowledge of higher math to understand the activity. A Computer Called Katherine // Amazon- The book that started this entire blog post! 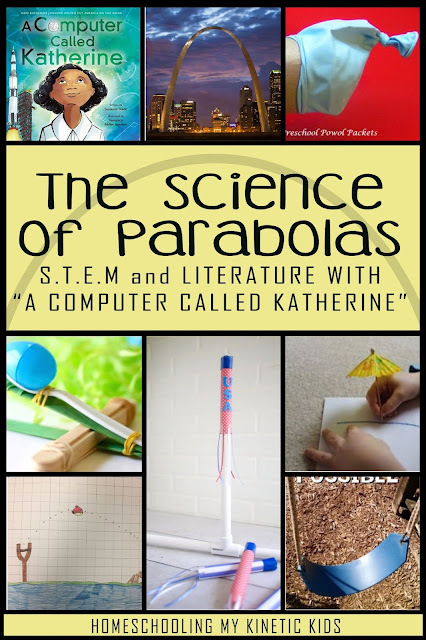 Although parabolas are not discussed in detail, they are introduced as part of the math formulas that Katherine needed to launch and land the rockets. 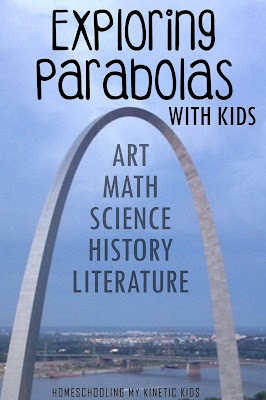 Parabolas in Real Life // Youtube- The St. Louis Arch is a parabola! Most fountains are parabolas too! 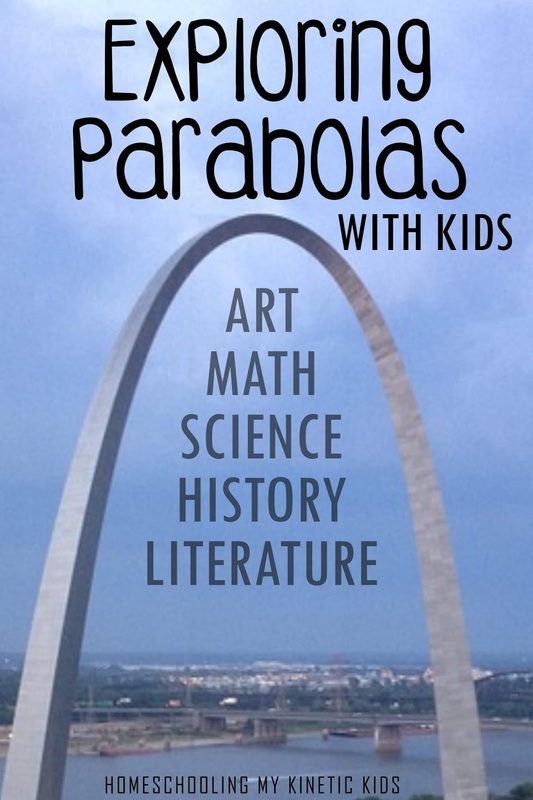 Hunt through art books, go on a field trip, or do a Google image search and see how many "real life" parabolas you can find. Science on the Swings // STEM Activities for Kids- My husband informed me that this isn't a true parabola, but for introducing the concept of a U-shape to kids, a swing set will work just fine. Marshmallow Shooter // Preschool Powol Packets- The shooter might not make the most obvious parabolic shape, but it'll get kids moving and giggling. Catapult // Little Bins for Little Hands- Launch an Easter egg, ping pong ball, or pom pom from the catapult and see who can get it closest to a set target. To tie it to the NASA space program, put the catapult on a world map and ask kids to land their "rocket" on a specific places in the ocean. Stomp Rocket // I Can Teach My Child- It's not exactly a NASA-style launch, but a stomp rocket can be a lot of fun and can help kids see how rockets go up. Punching U-Shapes // How to Run a Home Daycare- For early learners who haven't had any previous exposure to parabolas, just drawing or punching the shape helps cement the shape in their heads. My kids also enjoyed going on a "U-shaped Lines" hunt around the house. Angry Birds Parabolas // Algebra 2 Coach- Older children who are ready to graph their own quadratic equations will enjoy them more if they get to play around with a familiar video game and play with technology. This blog give you all the details and programs to use. Of course, any sort of launching game would work as well. 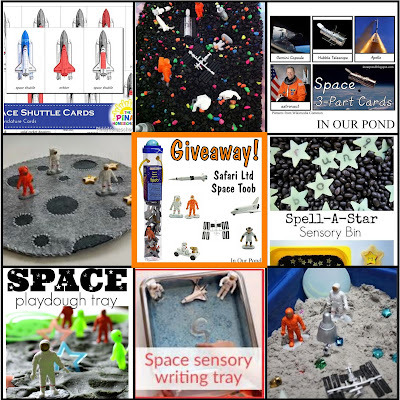 Safari Ltd has graciously donated a Space Toob of mini figurines for me to giveaway on my blog! Enter the contest on the Rafflecopter box below! Prize has no cash equivalent and winners must be from the continental USA only (sorry). Space toob will be sent to the winner from Safari Ltd. Contest closes on April 5th, 2019. This post is the last in the Storybook Science Blog-Hop for 2019. So many amazing bloggers have been writing content all month with experiments to go alongside books. Click on the picture to see all the great ideas and be sure to pin this image so you can find all the posts for later. This sounds like a cool book! I don't know a lot of women in science, so I am excited to learn more. I don't know that I have a favorite; I love all of their inspiring stories. My daughter's favorite is Marie Curie. 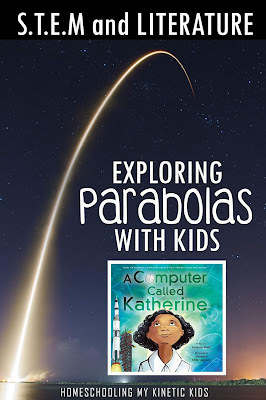 I love all of the ways you found to explore parabolas! My favorite women in S.T.E.M would have to be Marie Curie! She is the only women to win two Noble Prizes! Elizabeth Bragg, I believe she paved the way for engineering!